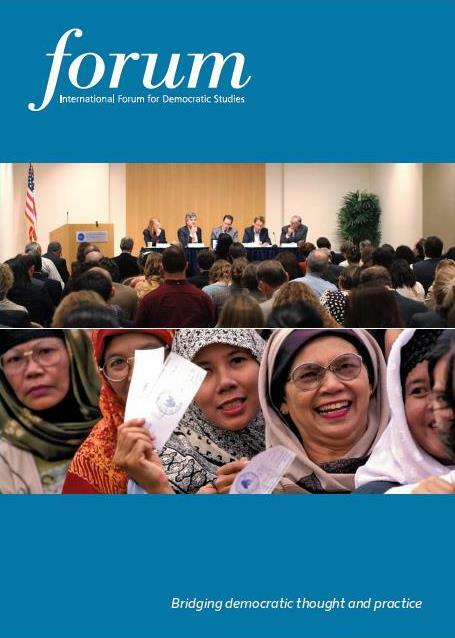 At a time when understanding what helps or hinders democratic progress around the world is more critical than ever, the International Forum for Democratic Studies is uniquely positioned at the nexus of democratic scholarship and activism to address these complex issues. As a leading center for analysis and discussion of the theory and practice of democracy around the world, the Forum complements NED’s core mission – assisting civil society groups abroad in their efforts to foster and strengthen democracy – by linking the academic community with activists from across the globe. Through several interrelated and expanding initiatives, the Forum responds to challenges facing countries around the world by analyzing opportunities for democratic transition, reform, and consolidation. Given the growing authoritarian pushback against democracy, understanding the increasingly sophisticated methods of authoritarian regimes represents another crucial area of study. Publishing the Journal of Democracy, the leading academic journal on democratization. Hosting Fellowship Programs for international democracy activists, journalists, and scholars. Coordinating the Network of Democracy Research Institutes (NDRI), a global think tank network. Organizing research initiatives, conferences, and events to explore critical themes for democratic development. Producing Power 3.0: Understanding Modern Authoritarian Influence, a blog exploring how savvy authoritarian government survive and thrive in a globalized information age and how democracies contend with this challenge. Among the Forum’s central activities are research and conference initiatives that seek to analyze the challenges of democracy and democratization. In addition to organizing public and private events featuring expert analysis on the challenges to democracy around the world, the Forum also contributes to ongoing debates on democracy by sharing new research and analysis from its network of democracy scholars through a number of digital platforms. Issue Brief Series, a collection of short explainers with links to in-depth research on propaganda, authoritarian influence, and more. Q&A Series, an cluster of one-on-one exchanges with leading thinkers and activists on digital disinformation, transnational kleptocracy, and more. Big Question Series, a selection of expert opinions on important, unfolding issues relating to democracy. “Sharp Power: Rising Authoritarian Influence,” a report published by the International Forum for Democratic Studies examining Chinese and Russian influence in four young democracies in Latin America and Central Europe. Seymour Martin Lipset Lecture Series on Democracy in the World. To learn more about the work of the Forum, visit the Forum News section and browse our Events listing. For additional information, email forum@ned.org.